Active Kids are Healthy Kids. With the NETS Active Play App from Neighbourhood Toy Stores of Canada we're providing parents with insights and ideas for active play, with dozens of quick tips and weekly active play content from our friends at ParentsCanada. Over 40 Indoor Play, Outdoor Play and Quiet Time toys, games and puzzles highlighted in the app. 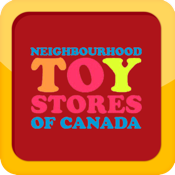 The app includes a QR code reader and you'll find lots of exciting codes to scan in your Neighbourhood Toy Store - just browse the locations in the app to find your closest NETS retailer.